An excerpt from Vaasanthi's Amma: Jayalalithaa's Journey From Movie Star To Political Queen. IMAGE: M Karunanidhi with Tamil matinee idol M G Ramachandran. Once close colleagues in the DMK, they later went on to become bitter political rivals, with MGR starting his own party, the AIADMK. The tumultuous ups and downs in her (J Jayalithaa's) relationship with MGR (M G Ramachandran) started in the early 1970s when MGR increasingly began to act with younger heroines like Latha and Manjula, thanks to the dogged perseverance of RMV (R M Veerappan). 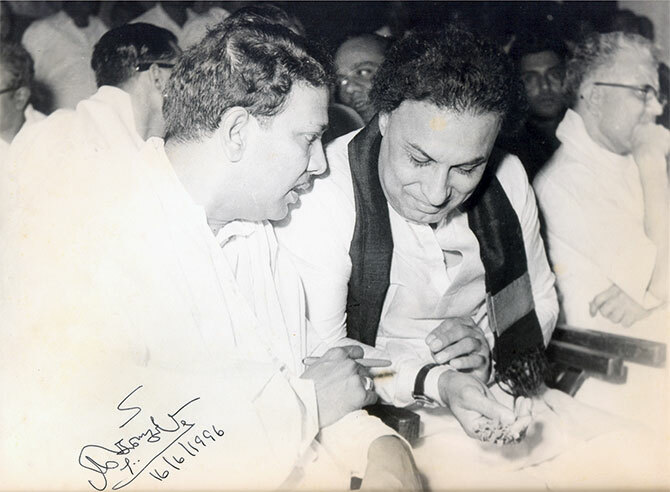 MGR also got preoccupied with politics as he was the DMK party treasurer in Karunanidhi's government. Then serious differences arose between him and Karunanidhi, but according to RMV even this was because of Jayalalithaa's influence. MGR and Karunanidhi had once been close. When C N Annadurai died, (V R) Nedunjezhian, the senior-most, was expected to succeed him. But MGR strongly recommended Karunanidhi's name and, through his influence, party workers got him elected to the post. Karunanidhi, however, threatened by MGR's popularity, cleverly excluded him when he formed the cabinet and made him the treasurer of the DMK party. IMAGE: Jayalalithaa in her early years as a reigning Tamil film star. 'Film News' Anandan, who was closely associated with Jayalalithaa as her PRO at that time (she was the first south Indian actor to appoint a PRO on a regular salary), believed that people around MGR were jealous of her fame and proximity to MGR. Jayalalithaa was then building her house in Poes Garden. When it was complete, the entire film industry turned up for the house-warming function except for MGR. Everyone was surprised at his absence because rumours about their liaison abounded. 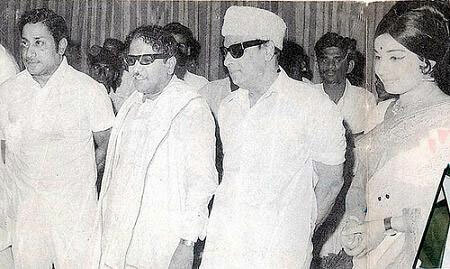 IMAGE: Matinee idol Sivaji Ganesan, Karunanidhi, MGR and Jayalithaa. Anandan said, "Next morning she had to go to Kashmir for shooting. She boards the plane and finds MGR in the next seat! 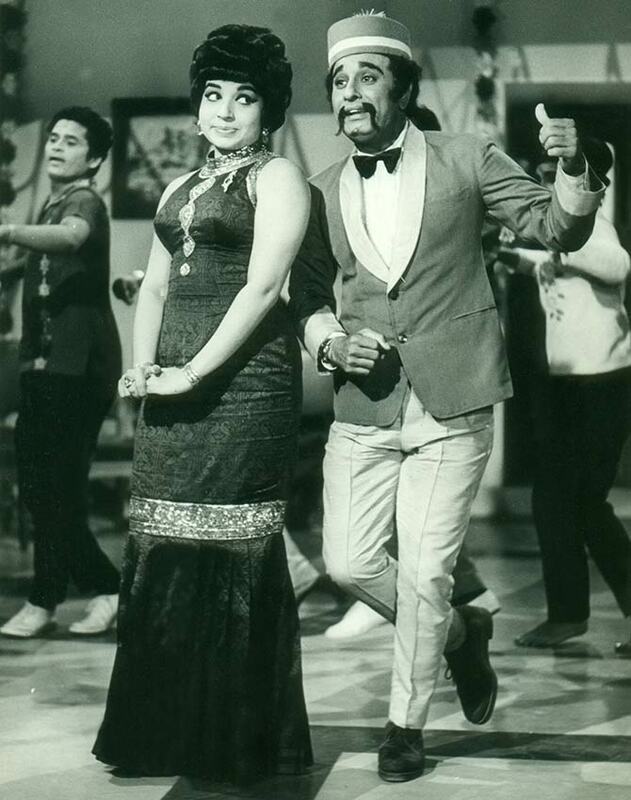 MGR also had a shooting schedule in Kashmir, but Jayalalithaa was acting with Sivaji Ganesan in another film. The two locations were 40 miles apart." "But after reaching Kashmir MGR took her along with him and would send her to her shooting location 40 miles away. Jayalalithaa could have had no say in the matter. If MGR says something, it had to be done." But after a while, Jayalalithaa found MGR overbearing and dominating. He started controlling all her activities including the clothes she wore. He even took control over her finances and she had to depend on his good mood for its release. She felt stifled and wanted to break free. 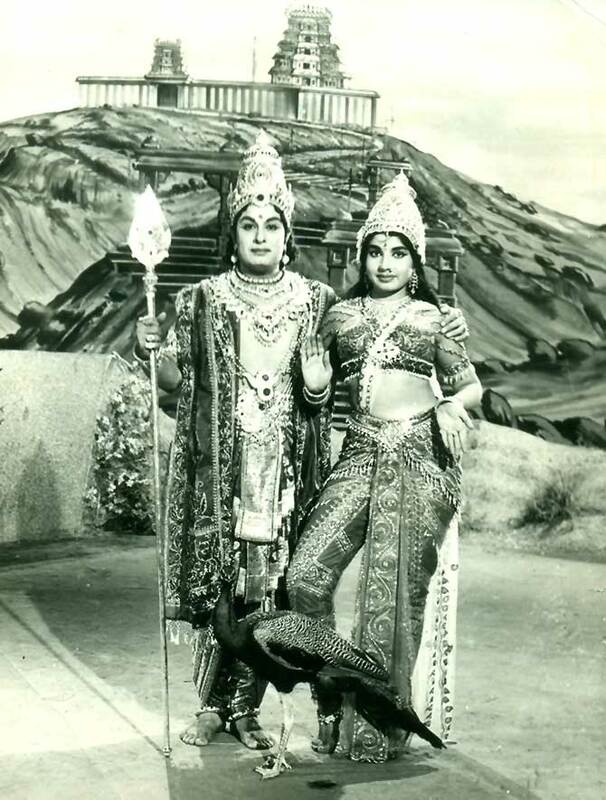 IMAGE: MGR as the Tamil deity Lord Murugan and Jayalalithaa as his wife, Valli, in one of their many movie roles. R M Veerappan on the other hand sees Jayalalithaa as the manipulator and oppressor in that relationship. He recounts, "The '71 assembly election was won because, during the last stage, I saw to it that MGR led the campaign though Karunanidhi was reluctant. At the victory celebration, the cadres came with two garlands -- one for Karunanidhi and another for MGR. Our man is missing! He has left for Nepal with this lady, dressed as a Muslim." "He comes back, and she prompts him to ask for a ministerial berth that Karunanidhi has not cared to give him. A man who is a kingmaker, why should he stoop to that level? Karunanidhi said, 'You leave films and then come.' Till then MGR never had a desire to hold any political power or offices. She provoked this enmity between MGR and Karunanidhi so that she could spend more time with him." IMAGE: A poster announcing the restored version of Aayiraththil Oruvan, the blockbuster starring MGR and Jayalalithaa. The film was loosely based on the Hollywood blockbuster starring Errol Flynn, Captain Blood. Veerappan's view seems rather far-fetched -- MGR was in his fifties, too old to be influenced by someone less than half his age. And the split in the DMK was bound to happen. MGR's popularity was growing by leaps and bounds and Karunanidhi felt eclipsed and threatened, even though it was MGR who had got him the chief minister's post after Annadurai's death. After the 1971 elections MGR had also become a member of the legislative assembly, besides being the treasurer of the DMK. And he was prone to ask too many uncomfortable questions in public. Karunanidhi expelled him from the party for indiscipline. IMAGE: Jayalalithaa and MGR in Engal Thangam. One week after his expulsion, on October 18, 1972, MGR announced the formation of a new political party -- the Anna Dravida Munnetra Kazhagam. MGR now become more deeply involved in politics and with that came a parting of ways between Jayalalithaa and him. For Jayalalithaa this was, in a way, liberation and she moved on to act with other actors. Excerpted from Amma: Jayalalithaa's Journey From Movie Star To Political Queen by Vaasanthi, with the permission of the publishers, Juggernaut Books. Available on the Juggernaut app and in bookstores.